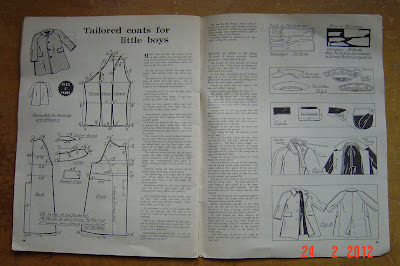 Predictably, I had to have a go at one of the designs from the Enid Gilchrist book in my last post. 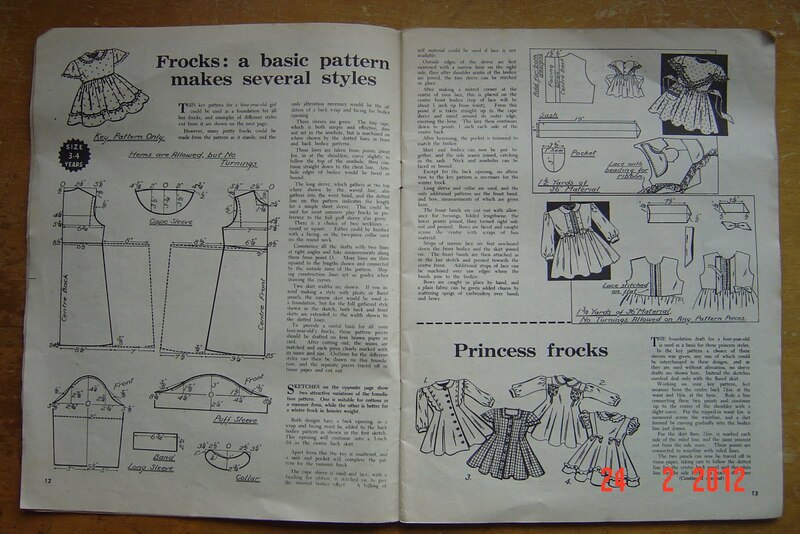 I decided to have a go at the basic dress, altered to princess line, to see how it compares to my current A-line draft. Extremely easy to draw up from her diagrams, by the way. Here's Enid's size3-4 princess line dress. Now obviously this isn't an apples for apples comparison - I would expect a size 3-4 to be smaller than a straight 4 (although not by much) and my A-line draft is slashed and spread right from the shoulder and so adds width through the torso as well as the skirt, whereas the princess draft actually nips in at the waist (this is optional). What I noticed particularly is that the armholes and neckline are pretty small - noticeable even on Nicholas (yes, he insisted on trying it on but lost interest before I got out the camera) . 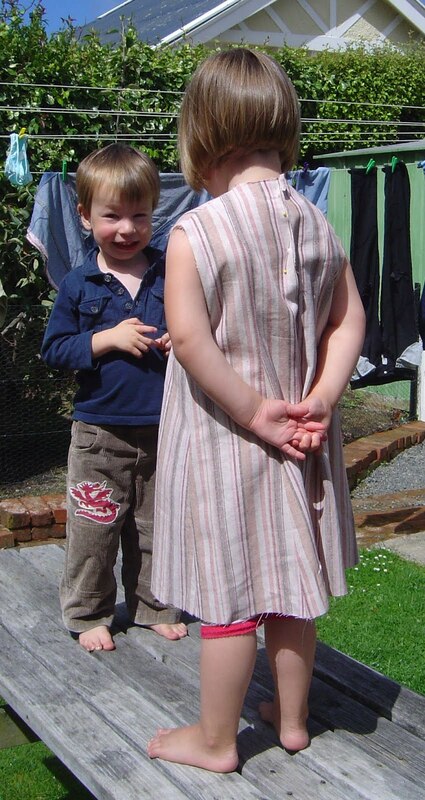 Her shoulder angle is very good on Isabella (it's being distorted a bit by the tight armholes), better than mine. Next task is to compare her bodice draft to my three and four and see how similar they are, particularly in the neck and armhole. 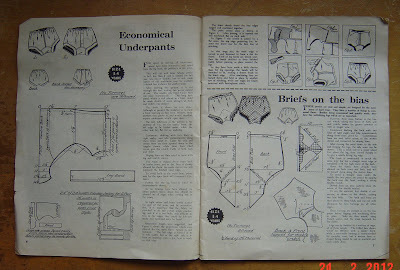 I wonder how much of the snug fit is due to the prevailing styles of 1951, and how much is due to the smaller size, which I would expect to be no more than half a size. 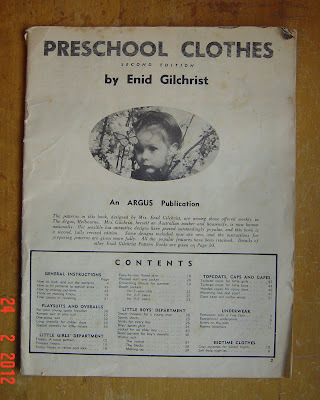 I haven't yet found any size charts for Enid Gilchrist's patterns so it's hard to tell exactly what the intended fit was. Is it odd that this sort of thing fascinates me? 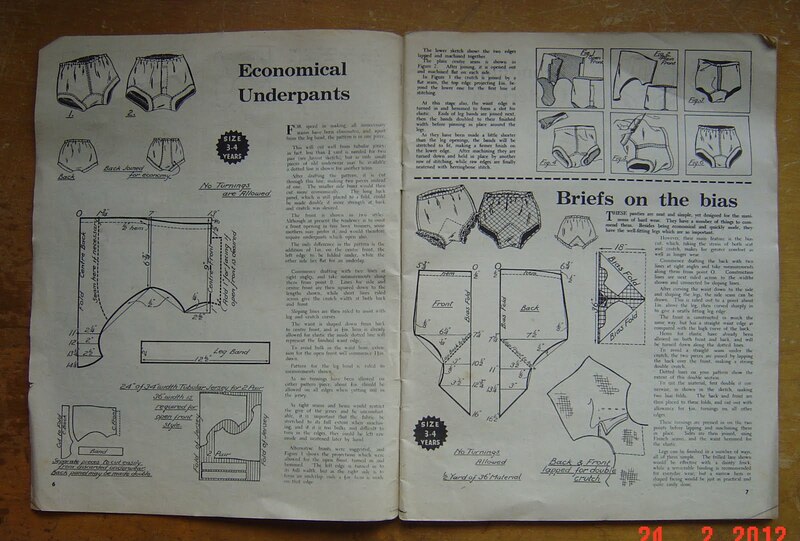 I have mentioned before that when people know you sew, they give you stuff. 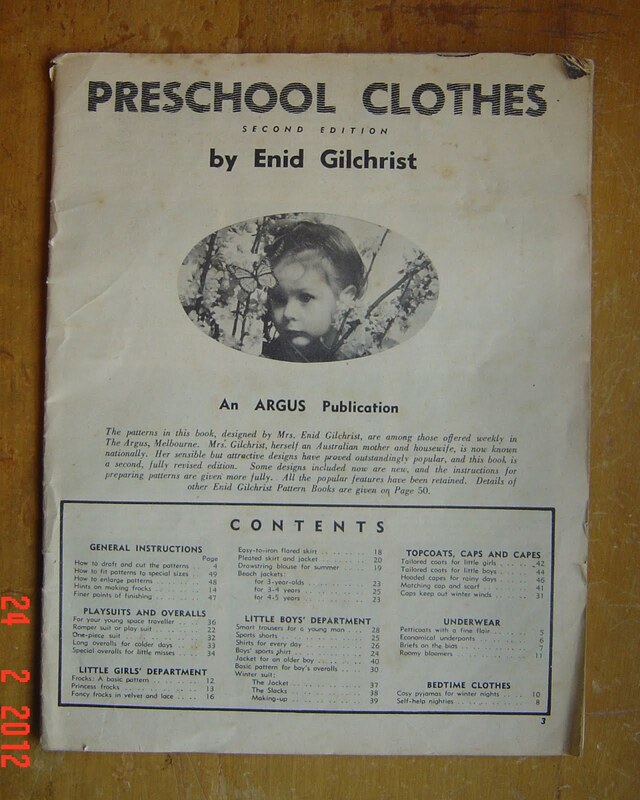 My score this time is a copy of "Preschool Clothes" by Enid Gilchrist, originally published in 1951 I believe. 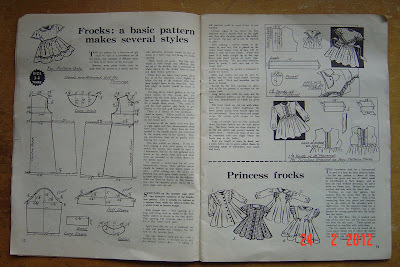 She published a number of sewing books for children in Australia from the fifties to seventies, showing how to draft the styles. Naturally this is of HUGE interest to me and I was given this one today, a bit battered and minus its cover but otherwise complete. Worthless to most people, priceless to me. I love old drafting books. You can learn so much from them! 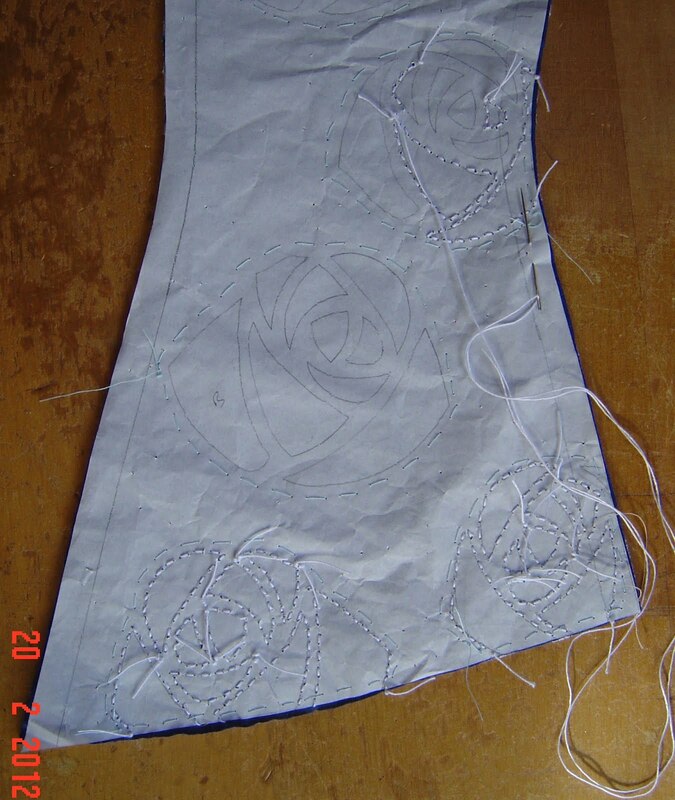 And today's parting shot - a peek at my latest Alabama Chanin corset top, the one for my sister. I removed the paper from one of the roses and snipped out the centres of the shapes so I could check that it's working as I expected. It is. 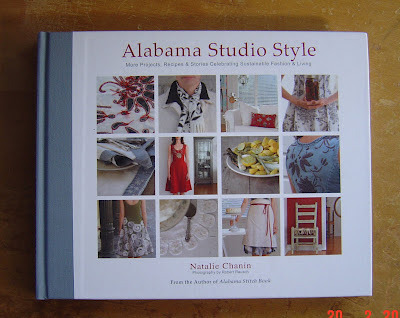 Will I ever tire of Alabama Chanin techniques? Unlikely. 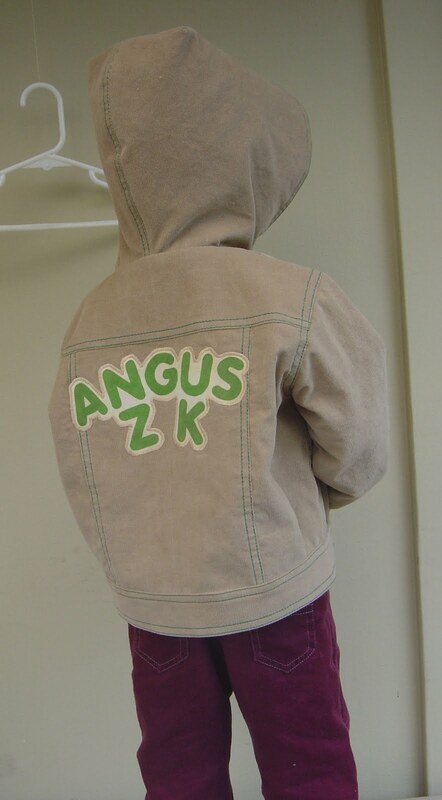 My younger sister asked if I could make a jacket for her and two friends to give another friend who had recently had her first child. They wanted to give her something special, custom made. Which led straight to me. This is the jacket whose hood was giving me a headache a couple of weeks ago. Size two, modelled very willingly by Nicholas. 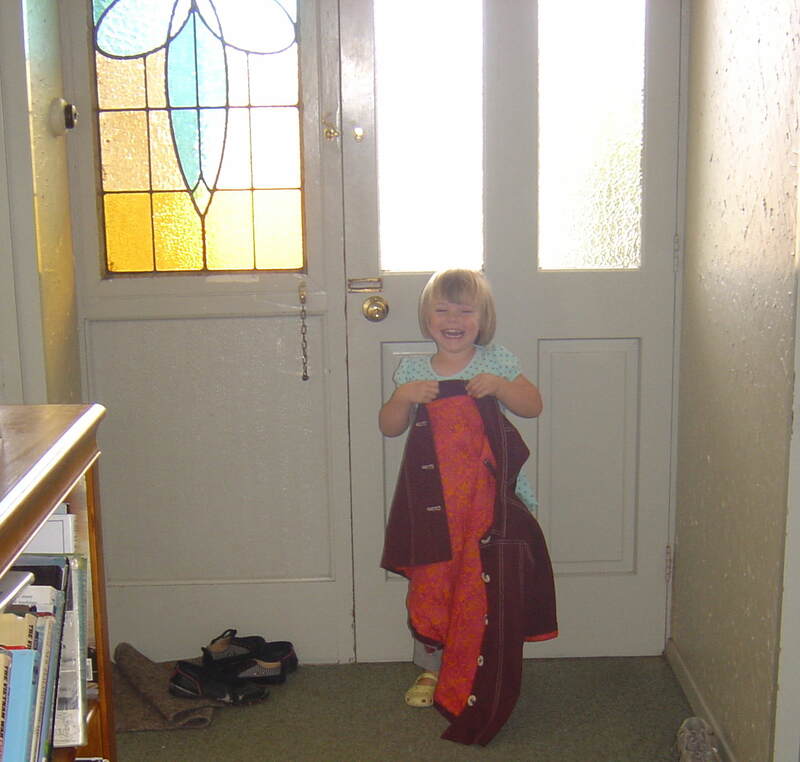 Aged three years, nine months. The recipient has one English parent, one Kiwi. And this is what I asked for in return. I've been through it cover to cover several times since she gave it to me last night. 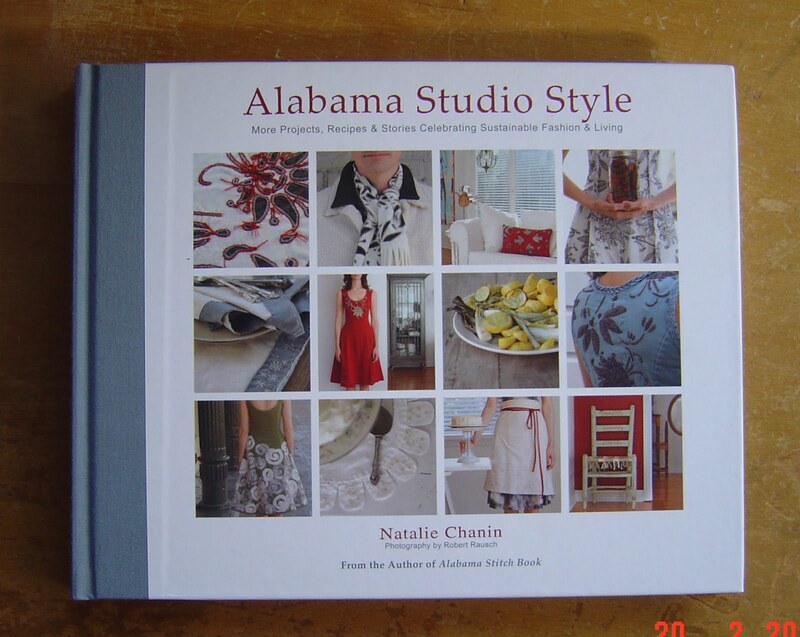 I love everything about Alabama Chanin, from the design aesthetic right through the simple but time consuming techniques and on to the championing of sustainable living. I have never been a designer groupie, but I love Natalie Chanin. If I ever win the lottery I'm going to Florence Alabama for a workshop. Or twelve. 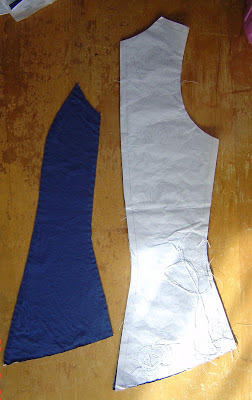 Anyway, I have fabric already for a dress, but have much musing to do over it's embellishment before I start. I also have to finish this. Yep, doing another one. This one is for my younger sister (the same one I bartered with for the book). She has always really admired the corset tops I've made for myself, and wondered whether she would be able to make one herself. Which she would, but I offered to make her one. There is a very very VERY short list of people for whom I would spend this amount of time and she is right at the top, for a lifetime (well, after we got to our teens and stopped fighting) of generosity and generally being great. I joked to her last night that I was so desperate to make another one (I love the process that much) that I'd almost have paid her to let me make one! She chose this petrol blue (I laughed my head off when I saw it because I chose the exact same colour the same day for my dress-to-be!) with a white underlayer. Because there wasn't to be any painting I figured that the easiest way to mark the roses on this dark colour was going to be good old stitch through a tracing then pull out the paper. 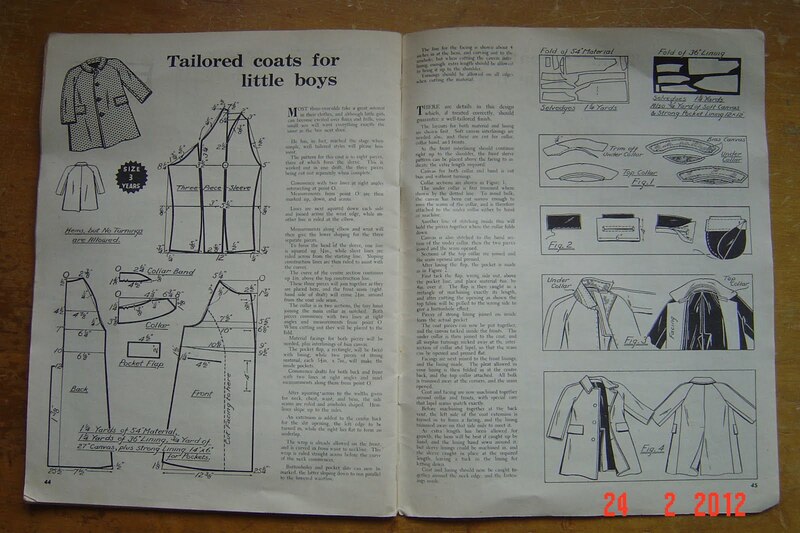 And in parting, a shot of Nicholas proudly showing the lining of his jacket. (Which I originally made for Cayden!) 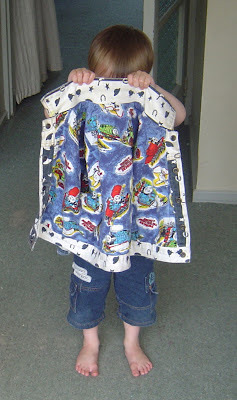 He is obsessed with Thomas the Tank Engine and despite wearing this jacket last year only just noticed the lining a couple of weeks ago. Now he does this to anyone who gets close enough. 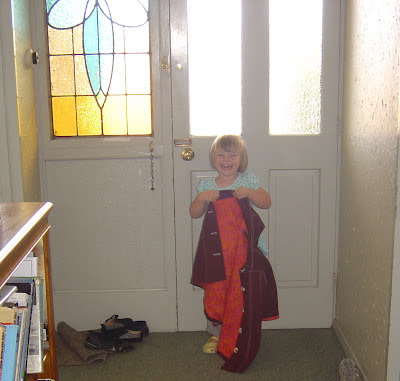 And because my twins now each have to do anything potentially fun looking that the other does, Isabella wanted a shot of her coat lining too. So, I made a quilt. I love my fortnightly craft get togethers for many reasons. One is that while there is considerable overlap in our interests, everyone has a different speciality. Michelle is our resident quilt nut. And she made us all do a mystery quilt along. Most of us had never made a quilt before. 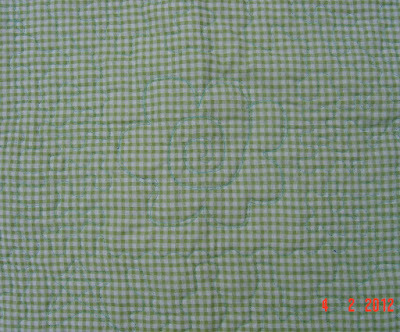 I am the only one who has finished, quilted (yay for Michelle's quilting machine - that thing is FUN!) and bound my quilt. I may have mentioned this once or twice. Per evening. But Michelle pointed out that I haven't actually blogged it. How remiss of me to miss a chance to show it off! So here it is, my very first quilt. Since it was a mystery quilt we didn't know what it was going to look like till it was done. Had I known I'd have planned my layout very carefully. Because that's how I do things. (Ask anyone who knows me.) 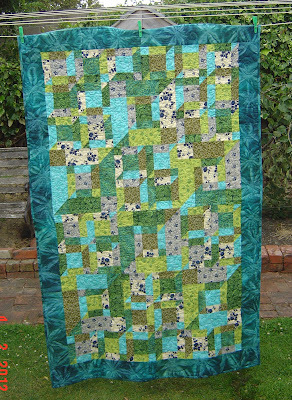 I love my quilt, but the whole mystery aspect is not for me - I like everything just so. (Hence my blog name, also everything just sew because I sew e-v-e-r-y-t-h-i-n-g.) What I did love was doing it as a group - it was enormously fun all together, mostly b****ing at Michelle for making us do it in the first place! 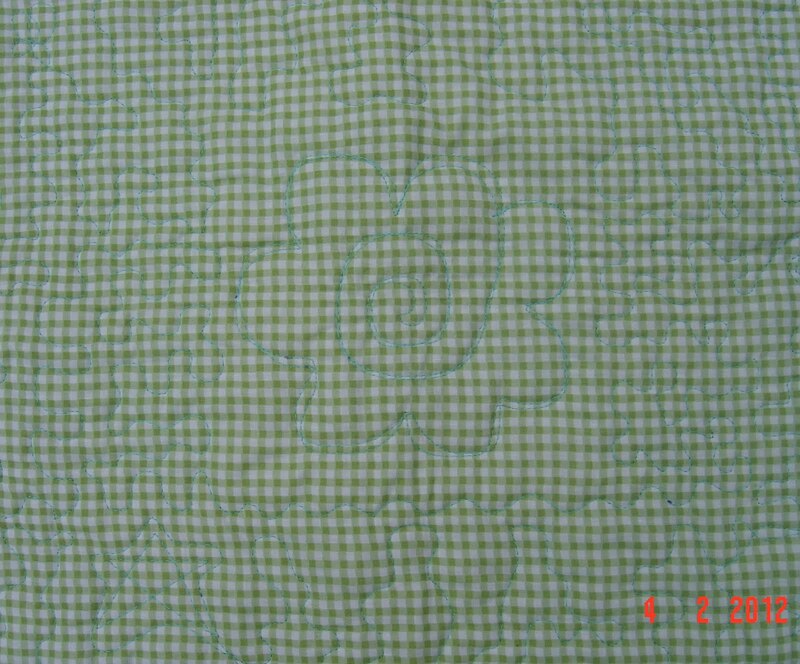 And her quilting machine makes me want to get seriously into quilting just so I can get one. 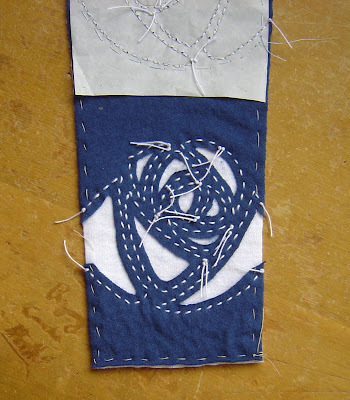 Speaking of the quilting, here's a closer look at some of mine. Those are supposed to be spirals. And round. I was very good at square spirals as it turned out!My perfectionist streak went out the window the second I began quilting because I knew it would take me years to get it perfect, and also because I want it to look like my first quilt. 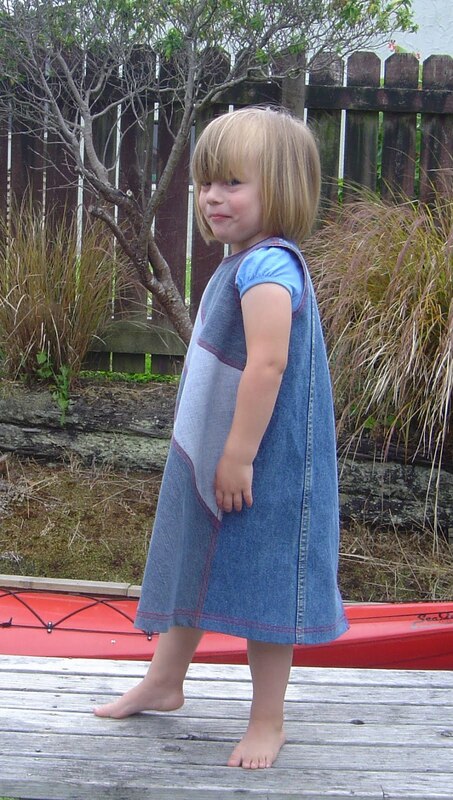 Yep, nailed the "first ever quilt' look. So there you are Michelle, just for you. 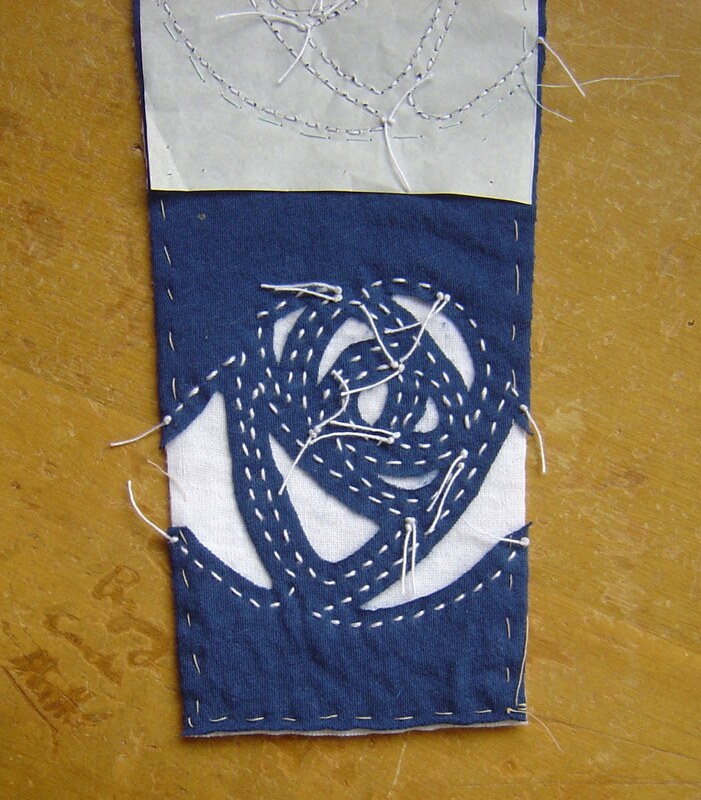 Thanks for the help/advice/laughs/use of your quilting machine/admonitions to "think round".